This week on Minecraft News, Toby and David cover a number of recent hot topics, such as bringing on new Mojang staff, a quick peek at the 360 version of Minecraft, details on this weeks' Snapshot, with focus on changes to cat behavior, villager AI, and a pleasant surprise change to lava! Additionally, the randomly-generated mineshafts scattered throughout the world appear to have received a visit from safety officials - they now generate with wooden flooring where gaps would have been in prior terrain generation, whether small potholes, or much larger gaps. Click the image above to check out this week's series! Did you read this article about 3D printing models from Minecraft and think to yourself, "I wish I could get one of those"? I know the feeling - it seems like there is an endless stream of possible models to print from my SSP games alone, nevermind any servers I play on. 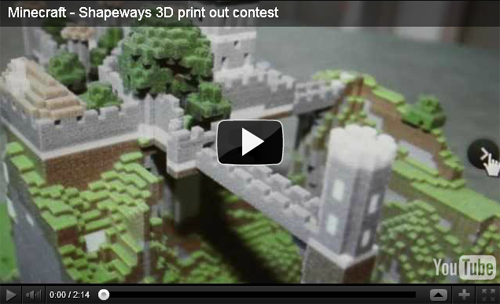 Still, for those of you looking for a 3D printout model of your creations, we have a sweepstakes that might be just what you're looking for - winners can receive, at no cost, a 3D printed model of their Minecraft creations, as well as $50 certificates for Shapeways, perfect for discounting larger projects, or outright buying smaller ones, like character models or small structures. Want to know more? Click the image above for details! Option 1: There is genuinely nothing happening in the world of Minecraft and writers are being pressured for articles so 3D printing is a good one to milk for content. Option 2: The 3D printing company is owned by someones brother/friend/pen pal/aunt, or pays for these articles. In any case, surely no news is better than 3D printing news at this stage? OOHHHh 3D model of one of my builds? im more interested to know what they are doing to lava ? i mean there isnt much to lava, its hot and flows and turns hard when you add water ?? This curse crap is really ruining the minecraft forums. 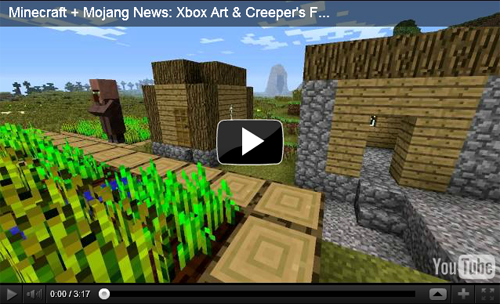 I would rather have no news than non-minecraft game news. I think skeletons should be afraid of dogs now, since creepers are afraid of cats. I hope that man was joking about giving creepers the ability to open doors. haha how can they open doors with no hands?